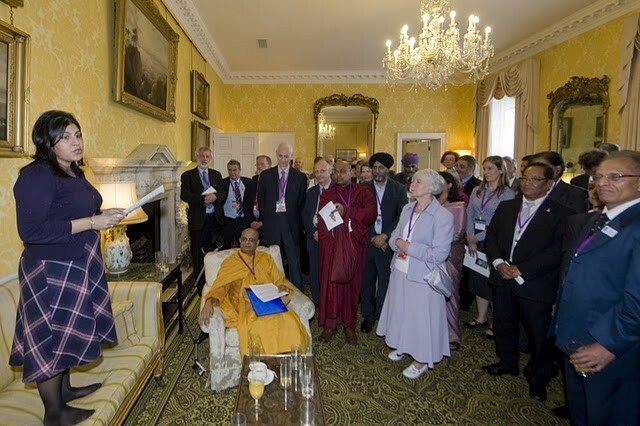 For the first time, in the history of The United Kingdom, Buddhism in Britain was honoured with a Celebratory Reception at Cabinet Office in the House of Commons in UK on Monday 13th June 2011. Venerable Akurala Samitha took part into this historical occasion. 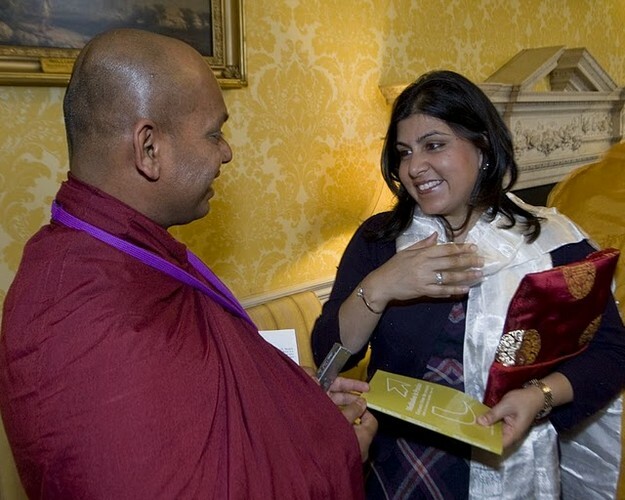 On behalf of the UK HM Government, The Rt Honerable Barones Warsi PC welcomes delegates from all walks of Buddhist schools and organization to the celebratory reception to recognise the contribution of the Buddhist Community in the UK. 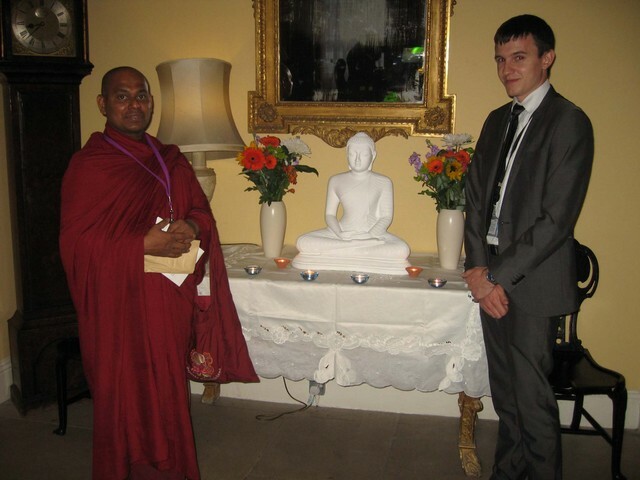 This event provided an opportunity for engagement with the Government and networking with the wider Buddhist community. The reception was included a wide range of Buddhist Organisations and Groups within the various traditions and communities. 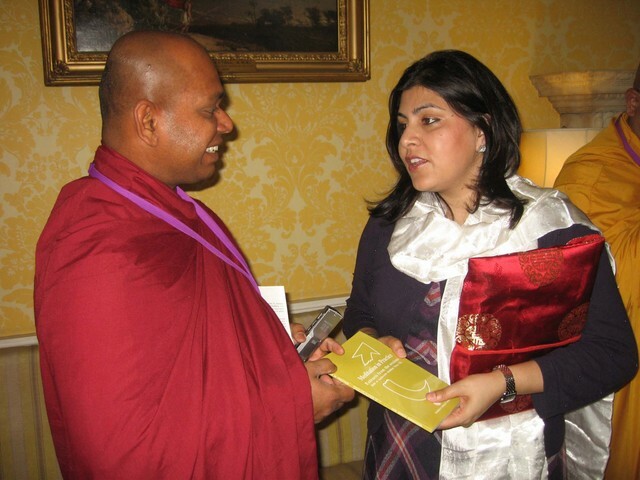 It aimed to highlight the great contributions that Buddhist groups, centres and communities make to British Society. What we now know as Buddhism began around 2555 years ago with the enlightenment of the Buddha Sakyamuni under the Bodhi tree at Bodhgaya, in Northern India. In the centuries that followed the Buddha's passing away (parinirvana) his teaching (Dharma) began to spread southwards from its place of origin in northern India to Sri Lanka, Burma, Thailand, Indo-China and other South East Asian countries. It also moved northwards into the Himalayan Kingdoms (Sikkim, Bhutan, Nepal), Tibet, Mongolia and other part of Asia, including China, Korea and Japan. This is a fortunate development because Buddhism had all but died out in India following a long decline that culminated with the Moslem incursions of the 11th Century CE. In more modern times, the spread of Communism virtually obliterated Buddhism from regions where it was once strongly established (e.g. China, Vietnam, Tibet, etc.). However, in the last few decades there has been something of a resurgence of Buddhism in these countries. Modern day Buddhist generally follow three main traditions: the Theravada or Southern tradition, The Mahayana or Northern tradition and The Vajrayana (mostly via Tibetan Buddhism). Since the 1950's Buddhism has become increasingly important in Europe and the Americas. In Asia, it continues to thrive in countries such as Sri Lanka, Burma, Thailand, Korea and Japan. 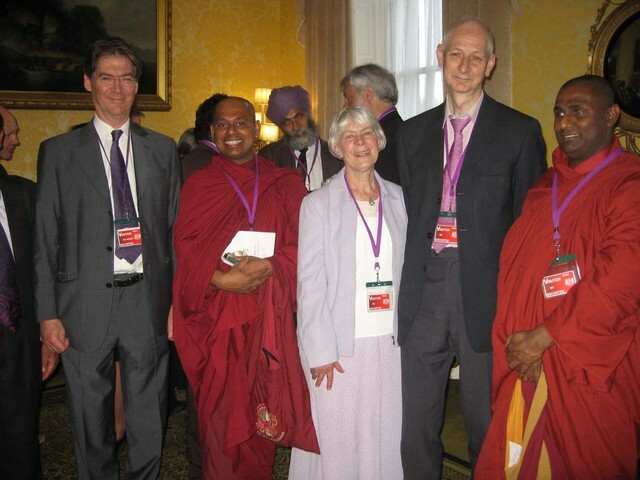 Many Buddhists in the UK come from families with ethnic links to one of the traditional Buddhist countries. However, in the last hundred years or so Buddhism has gradually established itself in the UK, taking a number of different forms. Consequently there is now a growing population of British people with no family background in Buddhism, who have adopted Buddhism as adults, and increasingly their children who have grown up as Buddhists in a Western milieu. The full moon of May marks the celebration of Wesak or Vaisakha Puja, a day when many people across the world celebrate the birth, enlightenment and passing of Shakyamuni Buddha. According to the Sri Lankan Theravada tradition, this year is a very special one, because the May full moon marks the 2600th Anniversary of the Enlightenment of the Buddha – celebrated as the Sambuddha Jayanthi (from jaya, a Victory, hence a banner, hence celebration). Even within the Buddhist tradition itself, the dates of the Buddha's life have long been a source of debate and Western scholars continually revise their estimates in the light of new historical evidence and theories. But however one thinks of it, the Jayanthi is an opportunity for all Buddhists to come together in devotion and joy to celebrate the life and activity of the founder of Buddhism, Buddha Shakyamuni, the 'Sage of the Sakyas'. The Enlightenment of the Buddha stands at the heart of the Buddhist tradition; without the enlightenment, there is no Buddhism. We celebrate the fact that despite all the conditioning that we have inherited – which according to modern science goes back to the first elements of life that appeared on this planet and down through the whole evolutionary tree – and that is now expressed in us, the most complex of all creatures, it is possible to be fully awake and aware in the absence of fear and compulsion. And from that awakening, in the absence of all hatred, grasping and ignorance, there emerges the kind of freedom that the Buddha taught as the 'end of suffering'. Someone who has followed this path sees clearly not only the human condition with all its weaknesses, passions and vulnerability, but also understands fully the dignity and mystery of what it is to be truly human being. By following the way of the Dharma (teaching of the Buddha) a path of transformation unfolds, moving us away from a narrow, blind and fearful state that brings with it so much suffering for ourselves and others, to one that leads to freedom from ignorance, true wisdom and a compassionate heart towards all beings. 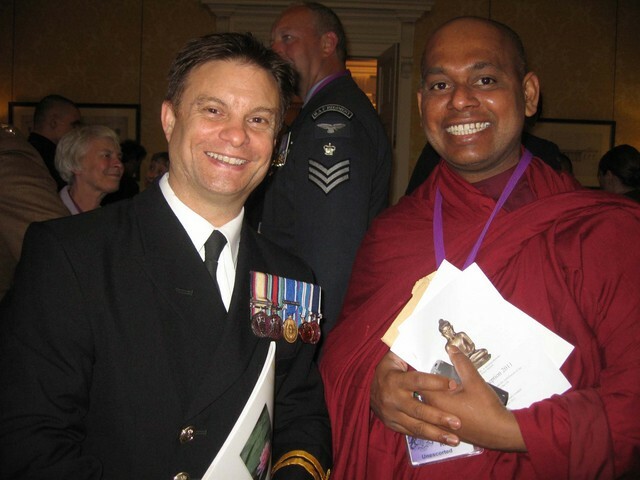 Buddhist Chaplaincy is an expanding field of activities and currently exists in several forms, covering Prisons, Hospitals, Hospices and the Military. 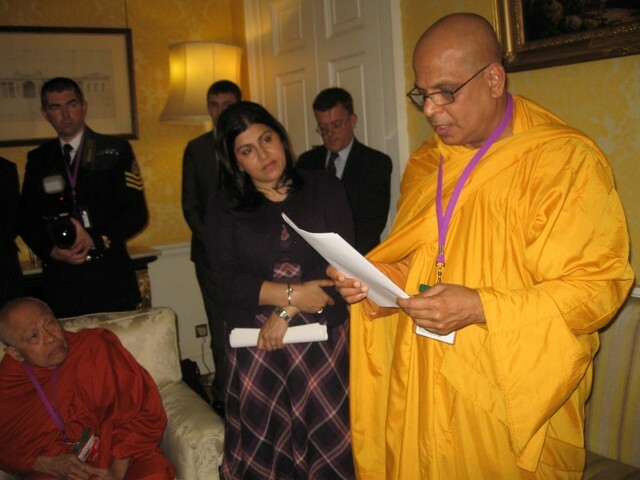 Buddhist Prison Chaplaincy was established on a formal basis in 1985 with the intention to make available facilities for the teaching and practice of Buddhism in Her Majesty's Prisons. A team of visiting Buddhist Chaplains, taken from a wide range of Buddhist traditions, offers spiritual guidance to prisoners held in HM Prisons and other custodial centres across the country. Regular training workshops are held for both existing chaplains and new recruits. There have been individual Buddhist volunteer chaplains working in healthcare settings for many years, offering spiritual support to patients and their families. More recently the NHS has been moving towards formal accreditation of chaplains from all the major religions, including Buddhism, and increasing numbers of Buddhist organisations and individuals are becoming involved with Healthcare Chaplaincy across the country. In 2005 the British Armed Forces recruited their first Sikh, Hindu, Muslim and Buddhist civilian chaplains, to support soldiers in all three of the armed services. 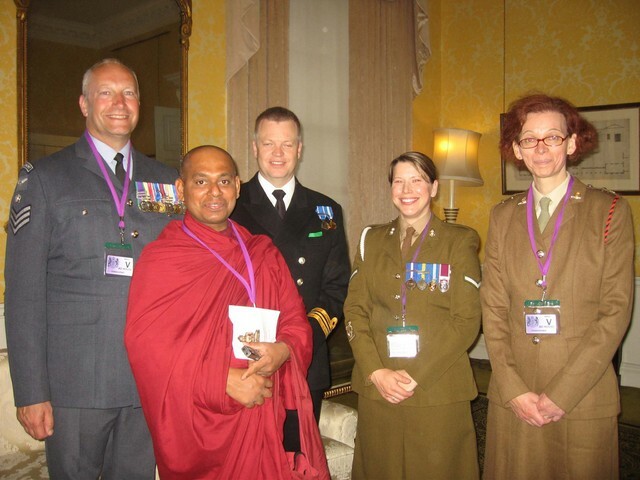 When the Buddhist Military Chaplain was first appointed there were 220 and there are now over 1000 Buddhist personnel identified as serving in the armed forces. 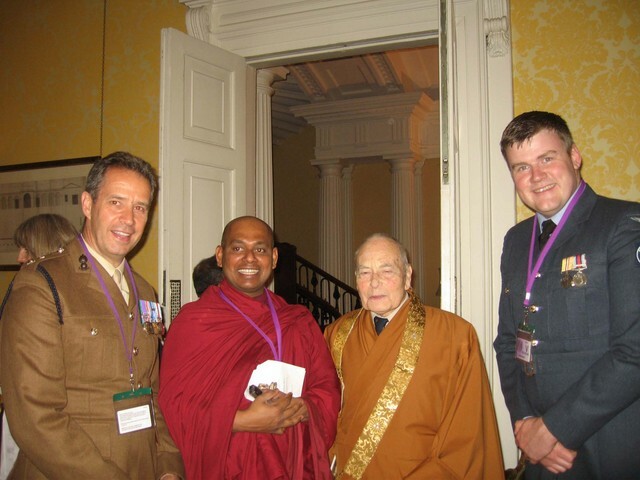 While generally appreciated as a sign of Buddhism taking a full role in our national life, the very existence of Buddhist Military Chaplaincy remains a controversial issue within the wider Buddhist community, with strong opinions expressed on all sides of the debate. Every local authority in England has SACRE which provides guidance for the council on the provision of religious education and collective worship. Each SACRE is made up of four groups, bringing a wide range of interests and talents to this work that reflects the local faith communities. A. Christian denominations (other than C of E) and representatives from a wide range of other faiths. B. The Church of England. D. Elected members of the Council. SACREs commonly meet several times a year, often in local places of worship so that members can gain a greater understanding of faiths other than their own. A SACRE can play an important role in developing and maintaining links between local religious communities. At these meetings, members discuss issues relating to Religious Education in local schools etc. and other educational establishments and monitor its delivery. Local SACRE members periodically revise the agreed local RE syllabus and offer support to schools in delivering it. SACREs also produce advice to support schools at times of local national international difficulty. Buddhist representation on SACREs is not limited to areas where there are substantial Buddhist communities. 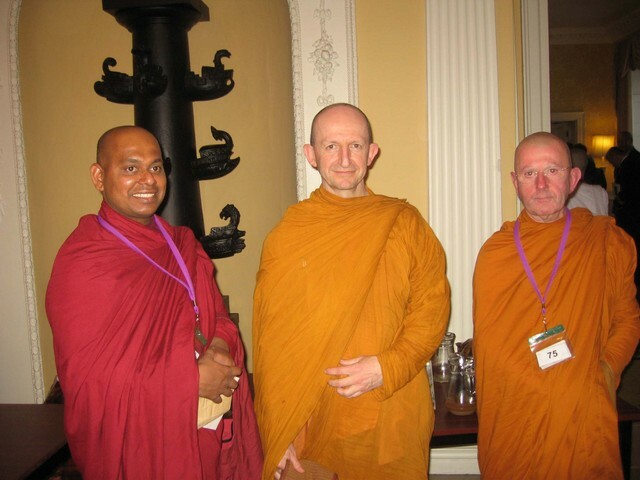 Because Buddhism has long been recognised as one of the 6 major religious traditions in the UK, many SACREs have wished to include a Buddhist rep.
Buddhist volunteers making visits to local schools to teach about Buddhism. 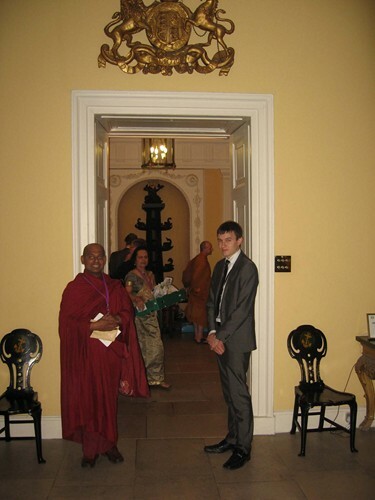 Buddhist temples and centre hosting visits from local school children. Producing relevant and up to date educational materials for children at the different stages of learning. 'Religious education is a vital subject for the promotion of core values; it enhances understanding and discourages prejudice. RE helps pupils to make sense of the world in which they are going to take place as adults, by knowing and understanding what it is that people believe and how this affects the way they live alongside each other. As Buddhism slowly becomes part of the landscape in western societies, it is naturally expected to make itself known, to contribute to the education of our children and community at large, and to promote the core values of tolerance, compassion, cohesion and solidarity. We live in a rather cosmopolitan environment, in a world which is fast becoming a 'global village', and it is of the utmost importance that we instil in our children the desire and confidence to explore cultures and traditions other than their own, that they do not feel threatened by diversity, and that they never lose sight of our shared humanity.